The history of wedding cakes and the tradition attached to them are rich. Before wedding cakes came to be what they are now, they’ve passed a lot of stages, all of which are equally interesting and intriguing. During the Roman times, the concept of elaborate wedding cake decorations and icings was not yet a reality. For instance, the groom is supposed to eat part of the wedding loaf. He would then break the remaining portion and it must be broken over the bride’s head. This symbolizes the groom’s dominance over the bride. This tradition, however, has long been eradicated possibly because of its chauvinistic implications. Also, in the olden times, small cakes (more like today’s cupcakes) are stacked to form the wedding cakes. 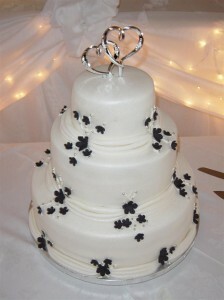 The notion of a white wedding cake is also very popular and was connected to affluence. Because ingredients used to make up the white icing are hard to come by, only those who can afford to travel to other places just to get hold of these cake “materials” can come up with white wedding cakes. Interestingly, in the 17th century, the idea of sleeping on a piece of cake became very popular. They say that if you put a piece of the wedding cake underneath your pillow, you will dream about your future spouse. In the 18th century, this tradition on wedding cakes evolved into the brides passing tiny cake crumbs through their wedding rings. These crumbs are then placed underneath the pillows. Later on, the traditional wedding cake slicing that we see today came about. The bride, with the help of the groom, creates two slices, and together, they eat that part of the cake. As this is the first task that that the couple does together, this act symbolizes their never-ending promise of supporting each other for the rest of their married life. Then came the multi-layered and elaborately designed cakes of many colors that we see today. Wedding cakes are not only white in color; today, the couple can experiment with different colors, usually making it consistent with the theme and the motif of the wedding. Still, another interesting fact about this tradition is that the couple tries to save the topmost tier of their wedding cakes. They preserve and freeze it for use during their first anniversary. But you don’t get to see this anymore today as the elaborate decorations make the cake more vulnerable. What proved to be a traditional and simple creation of cakes — or loaves of bread as in the olden times — now became a design extravaganza. 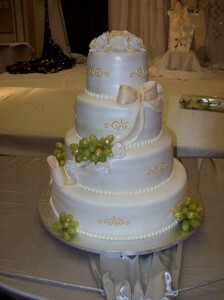 Numerous cake and pastry houses specialize on the design of wedding cakes. The internet even has a wide selection of wedding cakes. In conclusion, just like the wedding ceremony itself, the history and tradition of wedding cakes have come a long way. 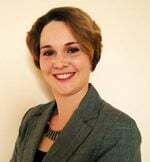 Some practices have long been eradicated while others survived the test of time and modernity. If you prefer a traditional wedding, then you’d surely insert some of the practices that survived in the ceremony and at the reception. Otherwise, you can skip these and just go directly to the sole purpose of the occasion. The most important thing however, is that you’ve respected the solemnity of the event and the importance of this sacrament. BestForBride.com is all about weddings – from wedding favours to designer wedding dresses and wedding cakes. Visit us today. This is so important cause, it represents the friendship and love that will continue to flourish within the marriage.